Video games, and video game theory, provide insight into the ways ubiquitous mobile computing will be used to transform social interaction. Cabdriving is a video game! Of course I know where that is, and as luck would have it, we were only a few blocks away. With a few taps of the screen, I navigated my car south and east from the Tenderloin, crossing Market at Fourth and coming up along the main entrance to Yerba Buena Gardens on Mission Street. Nothing happened; the passenger did not get out. Damn, is this game frozen again? There should be a flag here to mark my passenger’s drop-off location. I pinched and spread the map to zoom out, and then saw it: the flag was planted way over in the intersection of Third and Howard, on the far opposite corner of the park. Oh, of course. I was playing UberDrive, Uber’s new cabdriving (okay, “ridesharing”) simulation/game/recruiting tool. My virtual passenger, I realized, could not get out anywhere but at whatever specific location Uber’s GPS imagined to be “Yerba Buena Gardens.” Unfortunately, most of the streets around here are one-way, in the wrong direction. I maneuvered around three long city blocks, finally tapped the flagged intersection on the map, and watched the little car icon pull up. “Best ride ever!” beamed the passenger. Another five star rating! Hone your navigation skills? Tapping intersections on a map is a far cry from the experience of actually navigating through San Francisco’s downtown streets. I suppose UberDrive could help inexperienced drivers learn which streets are one way, and how the street grids connect across Market. Experience firsthand what it’s like to drive with Uber? As a training tool, the game is hardly realistic: every single passenger was polite, no one ever cancelled, no one threw up in the back seat, or tried to squeeze in more passengers than seatbelts; everyone was at their pinned location and ready to go when I rolled up. And every single passenger gave me five stars. In other words, they were completely unlike many Uber passengers. The interface allows the game designers at Uber, Lyft, etc., several tools for influencing the in-game behavior of both drivers and passengers: “surge pricing,” the five-star ratings system, and most importantly, the affective framing of “ridesharing” as different from (“Uber” than) the mundane experience of riding in a cab. This isn’t like those old taxicabs with their “inconvenient meatspace hailing”: it’s interactive tech, you know, more like a video game. There is a name for this combination of storytelling appeal and software-mediated control: the allegorithm, which means the unity of allegory and algorithm. This unity comes into play when, for example, a player satisfies a game’s algorithms by hitting a series of keyboard buttons with precise timing, while, within the storyline or "allegory," they embrace the idea that they are killing orcs with a flaming sword. Or maybe they tap a smartphone screen, while imagining that they are driving passengers around SoMa. But the allegorithm really comes into its own when it is deployed with mobile interfaces into “augmented reality.” Ingress, you are already thinking; but you should really think Uber. For the inelegance (and questionable pronounceability) of “allegorithm”, you can blame the word’s coiners, video game theorists Alexander Galloway and McKenzie Wark. But as a concept, it is of great importance for understanding how mobile interfaces are already connecting with and transforming social interaction, and how they will increasingly be used to do so in the near future. By saying that allegorithms transform social interaction into a “video game” I do not mean that they are making the “real world” somehow “less real” or less serious. The goal of gamification is not the distortion of reality behind some kind of mystifying curtain or spectacle, but the improvement of “meatspace” reality through the deployment of design lessons learned from game development. In practice, this means carefully manipulating the kinds of information and choices available to players, studying their motivations in order to encourage desired behaviors, and inventing a compelling storyline through which players can make sense of the "game." The results can range from the benign to the sinister, from the sublime to the laughable, and we will be seeing more and more of these as the revolution in ubiquitous, mobile computing continues to roll out. In the meantime, it can be useful to observe Uber’s allegorithmic gamification of cabdriving to assess how these initiatives will play out, and what successes or failures they are likely to encounter. The allegorithm needs, above all, a narrative which participants want to, and are able to, buy into; Uber (and its imitators) have shown great success with this so far, but how long can this be kept up? With any ubiquitously deployed allegorithm, the question arises as to how well the framing survives its insertion into the immersive “real world” environment. As I will discuss below, the success of the cabdriving-game deployed by Uber and others like it depends on the already gamelike aspects of cabdriving as a job; but risks coming apart when running up against the contradictions of cabdriving as work, and when the game designers, or the allegorithm itself, fail to predict or account for the real world complexity that players will encounter. And as with any social transformation, we need to keep questioning. How good are these games? Are these the games we really want to play? 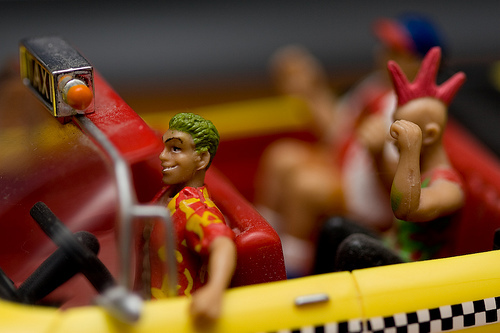 Crazy Taxi: from digital game-world to physical-world toy. Creative Commons photo by Tatton Partington. Cabdriving was, of course, already a video game – Crazy Taxi – and the story I was told goes like this. 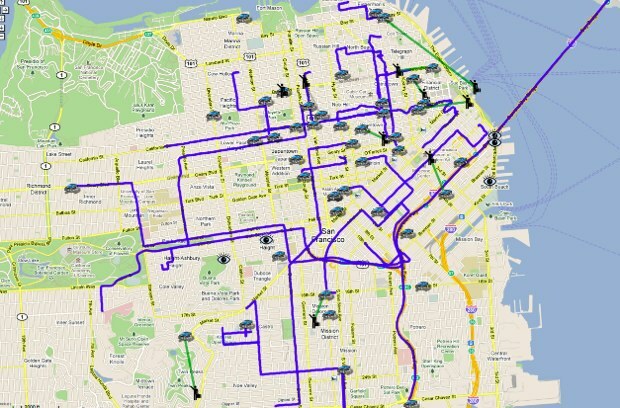 Three San Francisco cabdrivers had the idea to design a board game based on their job. They designed a board loosely based on San Francisco, with pieces that looked like cabs, which the players moved about town looking for paying customers, the winner being the one who made the most money in a set number of turns. Then one day one of the designers (the driver who told me the story) was told by his partners that they had sold the idea to a game company for a few thousand dollars. A few years later, Crazy Taxi hit the arcades, though as a video game rather than a board game. True story? It is hard to tell. Sega (producer of the game) attributes the idea to a Japanese game designer, not three San Francisco cabdrivers. Yet the original game in the franchise was clearly based on San Francisco, complete with its vertiginous hills, cable cars, and a choice of three bohemian taxi drivers as avatars. And the game captures at least some of the fun part of driving a cab in San Francisco. When I quit driving, I played the game as a way to enjoy some of the addicting aspects of the job. It was sort of like a nicotene patch for cabdriving. UberDrive, in contrast, is designed to be a gateway drug—a free sample to get you hooked, to pull you into the deeper game of “meatspace” driving. Every few minutes the gameplay is interrupted by an appeal to start driving for Uber in real-life. “No Thanks,” I click, and go back to playing pretend cabdriver. These games work because real-world cabdriving is, inherently, in many ways game-like. It is full of short, achievable objectives and quick rewards, won in exchange for taking calculable risks. It is more than a little like gambling, and can be as addicting, given the right personality. No matter how bad your luck gets, the player knows there are new possibilities waiting around the corner. Cabdriving may be gamelike, but it isn’t all fun and games. I titled my 2004 cabdriving auto-ethnography Playing for Hire to emphasize the dual sense of the taxicab driving experience in San Francisco. On the one hand, drivers constantly talked about their job as “playing” – “playing” the airport, “playing” the dispatch radio, “playing” the streets. On the other hand, this “play” is also “work,” and drivers need to make money—to pay the cab company for the vehicle, to pay for gas, to pay off all the numerous gatekeepers who must be tipped in the course of a shift, and finally, if any is left over, for themselves. K-ching! K-ching! is the name of the game. When MC Mars raps about cabdriving as a video game, he doesn’t paper over the bad or candy-coat the danger. He paints an image of cabdriving as a difficult job which demands and rewards the development of individual skill, “split-second reactions” and bravado. It's a view from the streets: a less controlled, messier, and more enjoyable experience than UberDrive, or for that matter, than Uber. Uber, and other smartphone-interfaced cab services, build on the already-gamelike aspects of cabdriving, while relying on allegorithmic design to ameliorate or obscure the job’s less gamelike, real-world difficulties. Before Uber, cabdriving was already gamelike, and it already had its interfaces: radio and computer dispatch, even smartphone apps like Taxi Magic and Cabulous. But before Uber and Lyft the allegorithmic potential of these interfaces had not been developed. UberDrive shows us how this is supposed to work: happy drivers transporting friendly customers, and making quick money. K-ching! "An Icarus flying above," the Uber GodView player looks down on "the devices of Daedalus in mobile and endlesss labyrinths far below" (de Certeau 1984: 92). Image by Uber. Perhaps UberDrive’s designers could make a better game if they got out on the streets and drove a bit. Perhaps Uber’s designers could benefit from the same exercise. Perhaps the folks at Uber HQ could make better games in general if they pondered a bit more critically how their own game’s allegorithm is shaping their experience. They do know they’re playing a video game... don’t they? Michel de Certeau, (1984) The Practice of Everyday Life. Berkeley: University of California Press. MC Mars, (2005) Don't Take Me The Long Way: 30 True, Truly Outrageous Cab Stories. San Francisco: Off D Edge Press.